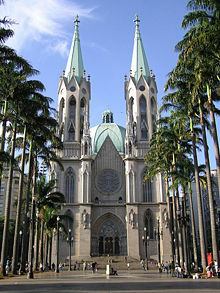 Cathedral of São Paulo, built in the mid-twentieth century, one of the world's most recent major buildings in the Gothic style. A cathedral is an impressive Christian church that traditionally contained the seat of a bishop. The great Cathedrals of the world represent one of humanity's many efforts to connect with God. During the Middle Ages, Cathedrals were especially important in the lives of medieval Christians for serving a variety of functions: they were places for communal worship, ritual, celebration, education, and governance. In particular, Cathedrals represented the seat of local authority and ecclesiastical power and frequently functioned as a social center, like a City Hall. It is a religious building for worship, specifically of a denomination with an episcopal hierarchy, such as the Roman Catholic, Anglican, Orthodox and some Lutheran churches, which serves as a bishop's seat, and thus as the central church of a diocese. Cathedrals were monuments to God's glory and greatness. Their towering structures represented a visual Axis Mundi for connecting with the Divine. Furthermore, they offered visual instruction to the generally illiterate masses who often learned about religion through observing the sacred art and architecture that adorned the cathedrals. The chair of Bishop Broughton, first Anglican Bishop of Sydney. The word cathedral is derived from the Latin noun "cathedra" (seat or chair), and refers to the presence of the bishop's or archbishop's chair or throne. In the ancient world, the chair was the symbol of a teacher and thus of the bishop's role as teacher, and also of an official presiding as a magistrate and thus of the bishop's role in governing a diocese. The word cathedral, though now grammatically used as a noun, is originally the adjective in the phrase "cathedral church," from the Latin "ecclesia cathedralis." The seat marks the place set aside in the prominent church of the diocese for the head of that diocese and is therefore a major symbol of authority. There are certain deviations on the use of the term "cathedral"; for example, some pre-Reformation cathedrals in Scotland now within the Church of Scotland still retain the term cathedral, despite the Church's Presbyterian polity which does not have bishops. As cathedrals are often particularly impressive edifices, the term is often used incorrectly as a designation for any large important church. The term "cathedral" is not officially used in Eastern Orthodoxy, the church of a bishop being known as "the great church." The Oriental Orthodox Churches similarly do not have cathedrals as such, however some major churches like Saint Mark's Coptic Orthodox Cathedral in Cairo are called cathedrals. Aachen Cathedral, Germany, founded by Charlemagne in 800 C.E. The cloisters of Lipari Cathedral, Sicily. The history of the body of clergy attached to the cathedral church is obscure, and in each case local considerations affected its development, however the following main features were more or less common to all. Originally the bishop and cathedral clergy formed a kind of religious community, which, while not in the true sense a monastery, was nevertheless often called a monasterium, the word not having the restricted meaning which it afterwards acquired. In this lies the reason for the apparent anomaly that churches like York Minster and Lincoln Cathedral, which never had any monks attached to them, have inherited the name of minster or monastery. In these early communities, the clergy often lived apart in their own dwellings, and were not infrequently married. In the eighth century, Chrodegang, bishop of Metz (743-766 C.E. ), compiled a code of rules for the clergy of the cathedral churches, which, though widely accepted in Germany and other parts of the continent, gained little acceptance in England. According to Chrodegang's rule, the cathedral clergy were to live under a common roof, occupy a common dormitory and submit to the authority of a special officer. The rule of Chrodegang was, in fact, a modification of the Benedictine rule. Gisa, a native of Lorraine, who was bishop of Wells from 1061 to 1088 C.E., introduced it into England, and imposed its observance on the clergy of his cathedral church, but it was not followed for very long there, or elsewhere in England. During the tenth and eleventh centuries, the cathedral clergy became more clearly organized, and were divided into two classes. One was that of a monastic establishment of some recognized order of monks, often the Benedictines, while the other class was that of a college of clergy, bound by no vows except those of their ordination, but governed by a code of statutes or canons. Hence the name of canon. In this way arose the distinction between the monastic and other cathedral churches. In Germany and England, many of the cathedral churches were monastic. In Denmark, all seem to have been Benedictine at first, except Børglum, which was Praemonstratensian until the Reformation. The others were changed to churches of secular canons. In Sweden, Uppsala was originally Benedictine, but was secularized about 1250, and it was ordered that each of the cathedral churches of Sweden should have a chapter of at least 15 secular canons. In Medieval France monastic chapters were very common, but nearly all the monastic cathedral churches were changed to churches of secular canons before the seventeenth century. One of the latest to be so changed was that of Seez, in Normandy, which was Augustinian till 1547, when Pope Paul III dispensed the members from their vows, and constituted them a chapter of secular canons. The chapter of Senez was monastic till 1647, and others perhaps even later, but the majority were secularized about the time of the Reformation. In the case of monastic cathedral churches, the internal government was that of the religious order to which the chapter belonged, and all the members kept perpetual residence. The alternative of this was the cathedral ruled by a secular chapter; the dignities of provost, dean, precentor, chancellor, treasurer, etc., came into being for the regulation and good order of the church and its services, while the non-residence of the canons, rather than their perpetual residence, became the rule, and led to their duties being performed by a body of "vicars," who officiated for them at the services of the church. Durham Cathedral was under Benedictine rule. Wells, a rare example in England of management (briefly) by a Provost. The history of the cathedrals in Britain differs somewhat from that on the continent. Cathedrals have always been fewer than in Italy, France and other parts of Europe, while the buildings themselves tend to be very large. While France, at the time of the French Revolution had 136 cathedrals, England had 27. Because of a ruling that no cathedral could be built in a village, any town in which a cathedral was located was elevated to city status, regardless of its size. To this day several large English Cathedrals are located in small "cathedral cities," notably Wells and Ely Cathedrals, both of which rank among the greatest works of English Medieval Architecture. In the British Isles towns were few, and, instead of exercising jurisdiction over definite areas, many of the bishops were bishops of tribes or peoples, as the bishops of the south Saxons, the West Saxons, the Somersætas, etc. The cathedra of such a bishop was often migratory. In 1075, a council was held in London, under the presidency of Archbishop Lanfranc, which, reciting the decrees of the council of Sardica held in 347 and that of Laodicea held in 360 on this matter, ordered the bishop of the south Saxons to remove his see from Selsey to Chichester; the Wiltshire and Dorset bishop to remove his cathedra from Sherborne to Old Sarum, and the Mercian bishop, whose cathedral was then at Lichfield, to transfer it to Chester. Traces of the tribal and migratory system may still be noted in the designations of the Irish see of Meath (where the result has been that there is now no cathedral church) and Ossory, the cathedral church of which is at Kilkenny. Some of the Scottish sees were also migratory. Between 1075 and the fifteenth century, the cathedrals of England were almost evenly divided between those ruled by secular canons headed by a dean and those ruled by monastic orders headed by a prior, all of which were Benedictine except Carlisle. Two cathedrals, Bath and Coventry, shared their sees with Wells and Lichfield, respectively. The entire structure of the monastic and cathedral system was overthrown and reconstituted during the Reformation. Cathedrals which were once Roman Catholic came under the governance of the Church of England. All the English monastic cathedral chapters were dissolved by Henry VIII and, with the exceptions of Bath and Coventry, were re-founded by him as churches of secular chapters, with a dean as the head, and a certain number of canons ranging from twelve at Canterbury and Durham to four at Carlisle, and with certain subordinate officers as minor canons, gospellers, epistolers, etc. The precentorship in these churches of the "New Foundation," as they are called, is not, as in the secular churches of the "Old Foundation," a dignity, but is merely an office held by one of the minor canons. Henry VIII also created six new cathedrals from old monastic establishments, in each case governed by secular canons. Of these, Westminster did not retain its cathedral status. Four more of England's large historic churches were later to become cathedrals, Southwell, Southwark, Ripon and Saint Albans Abbey. Although a cathedral may be amongst the grandest of churches in a particular country or area, size and grandeur have never been requirements and in some places a cathedral church may be a modest structure. For example, early Celtic and Saxon cathedrals tended to be of diminutive size, as is the Byzantine so-called Little Metropole Cathedral of Athens. The plan of a cathedral generally takes the form of a cross which has both symbolic meaning and is functional in terms of church worship, allowing space for clergy, choir, chapels, processions a pipe organ and other activities and objects associated with cathedral tradition. A cathedral, in common with other Christian churches has an altar or table upon which the Eucharist is laid, a lectern for reading the Bible and a pulpit from which the sermon is traditionally preached. Cathedrals also have a baptismal font for the traditional rite of washing that marks the acceptance of a new Christian, (most usually an infant) into the Church. Particularly in Italy, baptism may take place in a separate building for that purpose. Within the church, an area, usually to the eastern end, is set aside for the ceremonial seats of the dignitaries of the church, as well as the choir. Cathedrals of monastic foundation, and some of secular clergy have square cloisters which traditionally provided an open area where secular activities took place protected from wind and rain. Some cathedrals also have a chapter house where the chapter could meet. In England, where these buildings have survived, they are often octagonal. A cathedral may front onto the main square of a town, as in Florence, or it may be set in a walled close as at Canterbury. There may be a number of associated monastic or clergy buildings, a bishop's palace and often a school to educate the choristers. The role of the cathedral is chiefly to serve God in the community, through its hierarchical and organizational position in the church structure. A cathedral, its bishop and dignitaries have traditional functions which are mostly religious in nature, but may also be closely associated with the civil and communal life of the city and region. The formal cathedral services are linked to the cycle of the year and respond to the seasons of the Northern Hemisphere. The cathedral marks times of national and local civic celebration and sadness with special services. The funerals of those famous within the community are invariably held at cathedrals. Some cathedrals, such as Aachen and Rheims are the traditional coronation places of monarchs. The bells of a cathedral are traditionally used signal the outbreak and the ending of war. Many cathedral buildings are very famous for their architecture and have local and national significance, both artistically and historically. Many are listed among the UNESCO World Heritage Sites. Not only may the building itself be architecturally significant, but the church often houses treasures such as stained glass, stone and wood statues, historic tombs, richly carved furniture and object of both artistic and religious significance such as reliquaries. Moreover, the cathedral often plays a major role in telling the story of the town, through its plaques, inscriptions, tombs, stained glass and paintings. Cathedrals, because of their large size and the fact that they often have towers, spires or domes were the major landmarks in cities or the countryside until the twentieth century with the rise of skyscrapers. Outside the British Isles, the earliest head of a secular church seems to have been the provost (praepositus, Probst, etc. ), who was charged, not only with the internal regulation of the church, and oversight of the members of the chapter and control of the services, but was also the steward or seneschal of the lands and possessions of the church. The latter often mainly engaged his attention, to the neglect of his domestic and ecclesiastical duties, and complaints were soon raised that the provost was too much mixed in worldly affairs, and was too frequently absent from his spiritual duties. This led, in many cases, to the institution of a new officer called the "dean," who had charge of that portion of the provost's duties which related to the internal discipline of the chapter and the services of the church. In some cases, the office of provost was abolished, but in others it was continued: the provost, who was occasionally archdeacon as well, remaining head of the chapter. This arrangement was most commonly followed in Germany. In England, the provost was almost unknown. Bishop Gisa introduced a provost as head of the chapter of Wells, but the office was afterwards subordinated to the other dignities, and the provost became simply the steward of certain of the prebendal lands. The provost of the collegiate church of Beverley was the most notable instance of such an officer in England, but at Beverley he was an external officer with authority in the government of the church, no stall in the choir and no vote in chapter. In Germany and in Scandinavia, and in a few of the cathedral churches in the south of France, the provost was the ordinary head of the cathedral chapter, but the office was not common elsewhere. As regards France, of 136 cathedral churches existing at the Revolution, 38 only, and those either on the borders of Germany or in the extreme south, had a provost as the head of the chapter. In others the provost existed as a subordinate officer. There were two provosts at Autun, and Lyons and Chartres had four each, all as subordinate officers. St. Sofia Cathedral in Kiev. The normal constitution of the chapter of a secular cathedral church comprised four dignitaries (there might be more), in addition to the canons. These are the Dean, the Precentor, the Chancellor and the Treasurer. These four dignitaries, occupying the four corner stalls in the choir, are called in many of the statutes the quatuor majores personae of the church. The dean (decanus) seems to have derived his designation from the Benedictine "dean" who had ten monks under his charge. The dean came into existence to supply the place of the provost in the internal management of the church and chapter. In England every secular cathedral church was headed by a dean who was originally elected by the chapter and confirmed in office by the bishop. The dean is president of the chapter, and with the in cathedral has charge of the performance of the services, taking specified portions of them by statute on the principal festivals. He sits in the chief stall in the choir, which is usually the first on the right hand on entering the choir at the west. Next to the dean (as a rule) is the precentor (primicerius, cantor, etc. ), whose special duty is that of regulating the musical portion of the services. He presides in the dean's absence, and occupies the corresponding stall on the left side, although there are exceptions to this rule, where, as at St. Paul's Cathedral, the archdeacon of the cathedral city ranks second and occupies what is usually the precentor's stall. The third dignitary is the chancellor (scholasticus, écoldtre, capiscol, magistral, etc. ), who must not be confounded with the chancellor of the diocese. The chancellor of the cathedral church is charged with the oversight of its schools, ought to read divinity lectures, and superintend the lections in the choir and correct slovenly readers. He is often the secretary and librarian of the chapter. In the absence of the dean and precentor he is president of the chapter. The easternmost stall, on the dean's side of the choir, is usually assigned to him. The fourth dignitary is the treasurer (custos, sacrisla, cheficier). He is guardian of the fabric, and of all the furniture and ornaments of the church, and his duty was to provide bread and wine for the Eucharist, and candles and incense, and he regulated such matters as the ringing of the bells. The treasurer's stall is opposite to that of the chancellor. In many cathedral churches are additional dignitaries, as the praelector, subdean, vice-chancellor, succentor-canonicorum, and others, who rolls came into existence to supply the places of the other absent dignitaries, for non-residence was the fatal blot of the secular churches, and in this they contrasted very badly with the monastic churches, where all the members were in continuous residence. Besides the dignitaries there were the ordinary canons, each of whom, as a rule, held a separate prebend or endowment, besides receiving his share of the common funds of the church. For the most part, the canons also speedily became non-resident, and this led to the distinction of residentiary and non-residentiary canons, till in most churches the number of resident canons became definitely limited in number, and the non-residentiary canons, who no longer shared in the common funds, became generally known as prebendaries only, although by their non-residence they did not forfeit their position as canons, and retained their votes in chapter like the others. This system of non-residence led also to the institution of vicars choral, each canon having his own vicar, who sat in his stall in his absence, and when the canon was present, in the stall immediately below, on the second form. The vicars had no place or vote in chapter, and, though irremovable except for offenses, were the servants of their absent canons whose stalls they occupied, and whose duties they performed. Outside Britain they were often called demi-prebendaries, and they formed the bachcrur of the French churches. As time went on the vicars were themselves often incorporated as a kind of lesser chapter, or college, under the supervision of the dean and chapter. There was no distinction between the monastic cathedral chapters and those of the secular canons, in their relation to the bishop or diocese. In both cases, the chapter was the bishop's consilium which he was bound to consult on all important matters and without doing so he could not act. Thus, a judicial decision of a bishop needed the confirmation of the chapter before it could be enforced. He could not change the service books, or "use" of the church or diocese, without capitular consent, and there are episcopal acts, such as the appointment of a diocesan chancellor, or vicar general, which still need confirmation by the chapter, but the older theory of the chapter as the bishop's council in ruling the diocese has become a thing of the past, in Europe. In its corporate capacity the chapter takes charge sede vacante of a diocese. In England, however (except as regards Salisbury and Durham), this custom has never obtained, the two archbishops having, from time immemorial, taken charge of the vacant dioceses in their respective provinces. When, however, either of the sees of Canterbury or York is vacant the chapters of those churches take charge, not only of the diocese, but of the province as well, and incidentally, therefore, of any of the dioceses of the province which may be vacant at the same time. In the Canon law of the Catholic Church the relationship of the bishop to his cathedral is often compared to the relationship of a pastor to the parochial church. Both are pastors over an area (the diocese for the bishop and the parish for the pastor) and both are rectors over a building (the cathedral for the bishop and the parish church for the pastor). In view of this, canon lawyers often extend the metaphor and speak of the cathedral church as the one church of the diocese, and all others are deemed chapels in their relation to it. A parish church that was formerly a cathedral is known as a proto-cathedral. 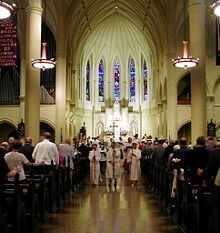 A parish church that is temporarily serving as the cathedral or co-cathedral of a diocese is known as a pro-cathedral. A church that serves as an additional cathedral of a diocesan bishop is known as a co-cathedral. The church of a diocesan bishop is known as a cathedral. A church to which the other diocesan cathedral churches of a province are suffragan is a metropolitan cathedral. A church under which are ranged metro-political churches and their provinces is a primatial cathedral. A church to which primatial, metro-political, and cathedral churches alike owe allegiance is a patriarchal cathedral. The title of "primate" was occasionally conferred on metropolitan bishops of sees of great dignity or importance, such as Canterbury, York and Rouen, whose cathedral churches remained simply metro-political. Lyon, where the cathedral church is still known as La Primatiale, and Lund in Sweden, may be cited as instances of churches that were really primatial. Lyon had the archbishops of Sens and Paris and their provincial dioceses subject to it until the French Revolution, and Lund had the archbishop of Uppsala and his province subject to it. As with the title of primate, so also that of "patriarch" has been conferred on sees such as Venice and Lisbon, the cathedral churches of which are patriarchal in name alone. The Basilica di San Giovanni in Laterano, the cathedral church of Rome, alone in Western Europe possesses a patriarchal character among Roman Catholics, since the Pope is the Patriarch of the Latin Rite church. However, in February of 2006, Pope Benedict XVI ceased the use of the title "Patriarch of the West." The removal of a bishop's cathedra from a church deprives that church of its cathedral dignity, although often the name clings in common speech, as for example at Antwerp, which was deprived of its bishop at the French Revolution. Technically, such a church is a proto-cathedral. Saint Louis Cathedral in New Orleans, Louisiana. Lutheran Helsinki Cathedral is Finland's most famous church. Night view of Notre Dame from the south, spring 2001. Shows the south rose window. ↑ New Standard Encyclopedia. (Chicago: Standard Educational Corp., 1992 ISBN 0873921976 set), B-262c. ↑ New Standard Encyclopedia, C-172/3. Cathedral, Catholic Encyclopedia, New Advent. This page was last modified on 18 January 2017, at 15:50.